One - 2 dram* (1/4oz) amber glass dropper bottle of Syn-Ake. *You may choose a larger size. SYN®-AKE is an excellent anti-wrinkle active compound with a snake venom-like mode of activity. SYN®-AKE smoothes mimic wrinkles in a short period. Age killing effect particularly effective against expression lines. Intensive anti-wrinkles care. SYN(R)-AKE peptide reduces muscle cell contraction and its action is reversible. You have the option to apply your actives directly into any product that you currently have or mix into our Formulating Cream. *Dare we suggest adding these actives into our Derma Snap 8L or GABA creams - which are both already teaming with penetration enhancers and other proven actives???? SYN(R)-AKE has been thoroughly tested and is considered to be appropriate for cosmetic applications. Each active will come in a 7.5ml glass amber bottle with a dropper for ease of usage. The percentage of actives is very high, and will only be mixed with 2 penetrating actives and a preserving ingredient. Our Neuro-Peptide-Actives are SUPER CHARGED to allow deep penetration into your skin. SYN(R)-AKE is a new anti-wrinkle active compound based on a synthetic tripeptide that mimics the effect of Waglerin 1, a peptide that is found in the venom of the Temple Viper, Tropidolaemus wagleri. 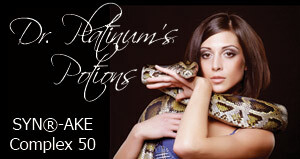 PENTAPHARM *(Syn-ake's manufacturer) has developed, over the past 30 years, a unique approach for the breeding and housing of venomous snakes and particularly the Brazilian Lance Adder Bothrops moojeni whose venom is used for therapeutic (anticoagulants, haemostatics) and diagnostic products. Currently, some 10, 000 specimens of this snake species are bred and housed at PENTAPHARM DO BRASIL, making PENTAPHARM the largest snake breeder and keeper in the world. The long experience of PENTAPHARM in snake venom research has made possible the investigation of venom' peptides for cosmetic applications. A special focus has been the investigation of the Temple Viper's venom. SYN(R)-AKE acts in a manner similar to that of Waglerin 1 which acts at the post-synaptic membrane. The peptide is an antagonist of the muscular nicotinic acetylcholine membrane's receptor (mnAChR). As the muscular nicotinic ACh receptors are blocked, the ion canal remains closed. There is no uptake of Na+ and the muscles stay relaxed. Source: McArdle, JJ, T L Lentz, V Witzemann, H Schwarz, SA Weinstein& JJ Schmidt. 1999. Waglerin-1 selectively blocks the epsilon form of the muscle nicotinic acetylcholine receptor. J. Pharmacol. Exp. Therap. SYN(R)-AKE is an excellent anti-wrinkle active compound with a snake venom-like mode of activity. SYN(R)-AKE smoothes mimic wrinkles in a short period. Suggested concentration:1-4% *Our formulation is a 5% (per 3 drops). Efficacy Tests- in vitro tests:The efficacy of the SYN(R)-AKE tripeptide (at a concentration of 0.5mM) has been demonstrated in vitro by measuring the frequency of contraction of the innervated muscle cells as a function of the incubation time. 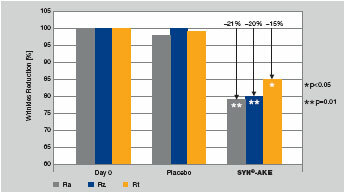 In vivo tests:The measurement of the smoothing and anti-wrinkle effect of SYN(R)-AKE (4%) was compared to a placebo. A cream was applied to the forehead twice daily during 28 days. SynN(R)-AKE - Age Killing Effect.The smoothing effect (Ra) was measured on 80% of thevolunteers and the anti-wrinkle effect (Rz, Rt) measuredon 73% of the volunteers. Results showed up to -52% of wrinkle size after28 days application! SEE detailed direction sheets in product photos (top of page). Apply this powerful elixir to your problem areas 2x daily before all other serums or creams. Expect to see noticable changes within 30-45 days. *SYN-AKE : Deionized Water, Glycerine, *Dipeptide Diaminobutyroyl, Benzylamide Diacetate, Gynostemma Pentaphylum, Panax Ginseng Root Extract, Ethoxydiglycol, Polysorbate 20, Benzyl Alcohol ( BA is natural anti-microbial, NOT a drying or grain alcohol), Methylisothiazolinone.